Sweat Free Houston meets every first Sunday of the month from 7-9 pm at 1303 Ruthven Street in historic Freedmen’s Town in Fourth Ward, that’s in Houston people! Be sure to call first to make sure there are no last minute changes, 832.771.7263 ask for Tim. Sweat Free Houston is planning a benefit concert at Mangos Cafe which is at the corner of Taft & Westheimer in the heart of the Montrose in Houston. Saturday March 6, 9 pm to 2 am. Only $5 cover gets you all these great bands. September 16, 7 pm in 160 Melcher Hall – Documentary “Stolen Childhoods” with Q & A with staffer from Interfaith Worker Justice center and a worker to follow. 160 Melcher Hall, (where Bauer College of Business is located). Stolen Childhoods is the first feature documentary on global child labor ever produced. The film features stories of child laborers around the world, told in their own words. Children are shown working in dumps, quarries, brick kilns. One boy has been pressed into forced labor on a fishing platform in the Sea of Sumatra, a fifteen-year-old runaway describes being forced into prostitution on the streets of Mexico City, while a nine-year-old girl picks coffee in Kenya to help her family survive. The film places these children’s stories in the broader context of the worldwide struggle against child labor. Stolen Childhoods provides an understanding of the causes of child labor, what it costs the global community, how it contributes to global insecurity and what it will take to eliminate it. Shot in eight countries (Brazil, India, Pakistan, Indonesia, Kenya, Mexico, Nepal and the United States), the film includes slave and bonded labor footage never seen before. It has framing interviews with U.S. Senator Tom Harkin (the leading legislative advocate for global action to eliminate child labor) and human rights advocates for children: Bruce Harris, Pharis Harvey, Inderjit Khurana, Wangari Maathai and Kailash Satyarthi. The film shows best practice programs that remove children from work and put them in school, so that they have a chance to develop as children and also have a chance of making a reasonable living when they grow up. Stolen Childhoods challenges the viewer to help break the cycle of poverty for the 246 million children laboring at the bottom of the global economy. Check out Stolen Childhoods website for more information. In response to plans to relocate and downsize the workforce at TRW, an automotive parts manufacturer in Reynosa, Mexico, the Coalition for Justice in the Maquiladoras has organized a speaking tour and a series of protests. On Sunday September 13th at 7:00 PM join Sedition Books in welcoming TRW worker Ernesto Lizcano. Multinational corporations such as TRW, which is a US corporation based in Livonia, Michigan, have profited from exploiting cheap labor, thanks to free trade agreements. After many years of phenomenal profits, TRW is laying off workers – without the severance payments that the workers are owed by law. Ernesto Lizcano was born in Veracruz. In 1999, when he was 20 years old, he immigrated to Reynosa to find a job in the maquilas. In July 1999 he started working in TRW Del Norte Industrial Park in Reynosa and he worked there until July 2009. Ernesto and his co-workers faced many challenges on the factory floor for many years. Recently, TRW relocated workers to a different facility on the opposite side of the city. The problem was that TRW provided no transportation, childcare, or consideration for seniority. Ernesto and more than 600 workers formed the TRW Workers Coalition to defend their rights. Ernesto was elected to the Coalition leadership by his co-workers and for this reason TRW management in Reynosa fired him and blacklisted him as trouble maker. Although he was fired, Ernesto continues to be active in the Workers’ Coalition fight for justice. Ernesto is traveling across the US and Canada calling for international solidarity on his way to a meeting with TRW executives on September 16th. Hey folks, our member Tim will host a radio show on KPFT, 90.1 FM on Friday July 24. The show runs from 9:30 – 10 am. We’ll discuss our campaign history and our new campaign to bring justice to campus workers. Sweatshop worker talk and film screening February 18, 7pm Cullen Auditorium. We’re going to screen Maquilapolis and have Carmen Duran, the principal cast member speak after the screening. We’re bringing her from Tijuana so you don’t want to miss it. Carmen works the graveyard shift in one of Tijuana’s maquiladoras, the multinationally-owned factories that came to Mexico for its cheap labor. Carmen takes a major television manufacturer to task for violating her labor rights. After the corporation cuts and runs leaving the worker’s holding the bag Carmen organizes and fights back. Check out the film’s website for more info: Maquilapolis This event, like all our events is FREE!!! Spring 2009 meetings start January 21. We meet every Wednesday @ 5:30 pm in the Salt Grass room on the second floor of the University Center. USAS member hosts radio show, December 22 @ noon on KPFT 90.1 FM. On Wednesday October 15 at noon we’re having a rally for Workers Rights. University of Houston janitors, food service workers and apparel workers are all getting a bum deal from our school. Meet in front of M.D. Anderson library. We’ll have plenty of signs, bring some friends and let’s make some noise. Maquiladora worker speaker event Thursday September 25 @ 7pm in Cullen Auditorium. Martha Ojeda, founder of Coalition for Justice in the Maquiladoras will facilitate the talk with a worker from Key Safety Systems in Mexico. See Coalition for Justice for more information on Martha Ojeda. Fall meeting schedule: We’ll meet every Wednesday @ 6 pm starting August 27 in the Saltgrass Room on the second floor of the UC. It’s right past the reservations office. Study in – Tuesday April 29, 2008 from 10 a.m. to 2 p.m. in 212 E. Cullen Bldg, in front of Dr. Khator’s office. We’ll be there to remind her to stop using sweatshops to produce UH logo clothes. Saturday, April 19, 8:30 a.m. – 4:15 p.m. Registration $25, $10 for students and low income people. Includes lunch and materials. For more information and to register, visit http://www.hpjc.org. Or write a check payable to HPJC and mail to P.O. Box 66234, Houston, TX 77266. Spring 2008 meeting schedule: We meet every Wednesday at 5:30 starting January 16th in the Baltic room in the University Center underground, except January 30 when we meet in the Tejas room, 2nd floor of the UC. 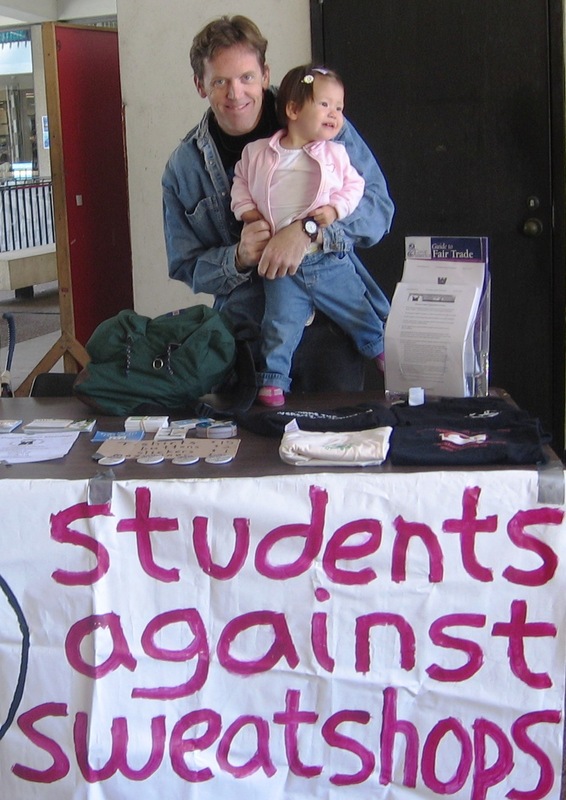 Spring semester tabling schedule: Every Wednesday from 10: am until 1:pm in the UC south side near the info booth and facing the Hilton Hotel. We’ll be hanging out and handing out literature, selling our t-shirts, giving away stickers and telling everyone about our upcoming events. Stop by and have a chat! China Blue film screening, 7 pm March 26 in the Pacific Room in the UC. Free. It’s a documentary about sewing jeans in a Chinese sweatshop. For more info on the movie click here. Sweat Free Awareness Day – February 25th from 10-3 in the U.C. south side. We’ll be preaching the gospel about treating people with dignity and explaining under what conditions the University of Houston has their logo clothes manufactured. February 27 Former Sweatshop Worker Speaker event / Labor forum @ 7 pm in the Pacific room. Chei Abad is the speaker see http://www.globalexchange.org/getInvolved/speakers/5.html for her biography. 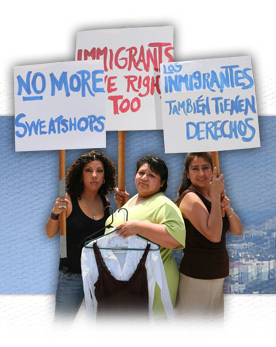 Garments & Globalization – February 13th from 10-3 in the U.C. south side facing the Conrad Hilton Hotel. We’ll have information and a fun activity to show the difference between clothes made in a sweatshop and clothes made in a safe working environment where the workers get paid a living wage. Film screening – “Made in L.A.” We’ll show this documentary on February 6th in the Atlantic Room in the University Center at 7 pm. The movie follows the remarkable story of three Latina immigrants working in Los Angeles garment sweatshops as they embark on a three-year odyssey to win basic labor protections from a mega-trendy clothing retailer. In intimate verite style, Made in L.A. reveals the impact of the struggle on each woman’s life as they are gradually transformed by the experience. Compelling, humorous, deeply human, Made in L.A. is a story about immigration, the power of unity, and the courage it takes to find your voice. Check out the website here. We’re hosting a radio show on KPFT! On January 30th from noon until 1 pm tune into 90.1 on your FM dial or stream it at http://kpft.org/. We’ll talk to Trina Tocco the Campaigns Coordinator for the International Labor Rights Forum and Carmencita Abad from Global Exchange. Ms. Abad worked in a sweatshop in Saipan for six years. Her full biography can be viewed here. Saturday December 15 from 12-2. Flyering at Galleria Footlocker store. In support of the Teamsters Union on Saturday December 15 from 12 noon until 2 UH Students Against Sweatshops will be passing out flyers at the Galleria Footlocker store. It’s on the lower level near the food court. The Galleria is at 5015 Westheimer. Call the Footlocker store for directions, 713.621.7268. See the main page of the blog for a link to the flyer. The last meeting of the semester is Wednesday November 28 at 4 pm in the Bluebonnet room in the UC. We hope to see you there. Sweatfree Awareness day Thursday November 8, 10-2 p.m. In conjuction with the United Students Against Sweatshops national day of action we’re having a sweat free awareness day on Thursday November 8. We’ll have some tables on the south side (facing the Hilton hotel) of the University Center. We’ll be asking folks that are passing by to take part in a one minute activity to learn something about sweatshops. Our next meeting is Wednesday November 7 at 4 pm in the Bluebonnet room in the UC. We hope to see you there. Our sister group, UH Students for Fair Trade is having their second annual Fair Trade Open House on October 17, 2007 in the Cougar Den in the University Center on campus. They’re having a free lunch and more. Check out their website for more details. UH SFT president Ross Barnard and historian Tim O’Brien will co-host the show. The first guest will be from Transfair USA and the second guest will be Kevin Lacobie who sits on the board of the Houston Ten Thousand Villages and is co-owner of Te House of Tea. Tune in at noon to KPFT 90.1 FM or stream them here. We’re showing a movie about a sweatshop in Kenya on Wednesday September 19 at 5 pm in the Atlantic Room. It’s a little less than an hour long. We’ll have a discussion afterwards and then head out for a few beers. Free campus screening of Stolen Childhoods, September 5th at 5 pm. The movie is about the high cost of child labor in the global community. It probes the complex causes of the phenomenom and recommends actions to eliminate gross human rights in our lifetime. It is narrated by Meryl Streep. The screening will take place in the Atlantic Room which is underground in the University Center. For those unfamiliar with our campus the UC is directly across from the Hilton hotel. You can park in the parking garage or under the hotel. After the movie we will discuss the University’s role in promoting sweatshop labor. UH SAS takes over the KPFT airwaves September 5th ! Don’t forget to tune in to KPFT 90.1 Fm on September 5 from noon to one p.m. when we’ll be hosting Open Journal. You will learn all the ugly things the University of Houston administrators are doing to support child, forced and slave labor on our campus.